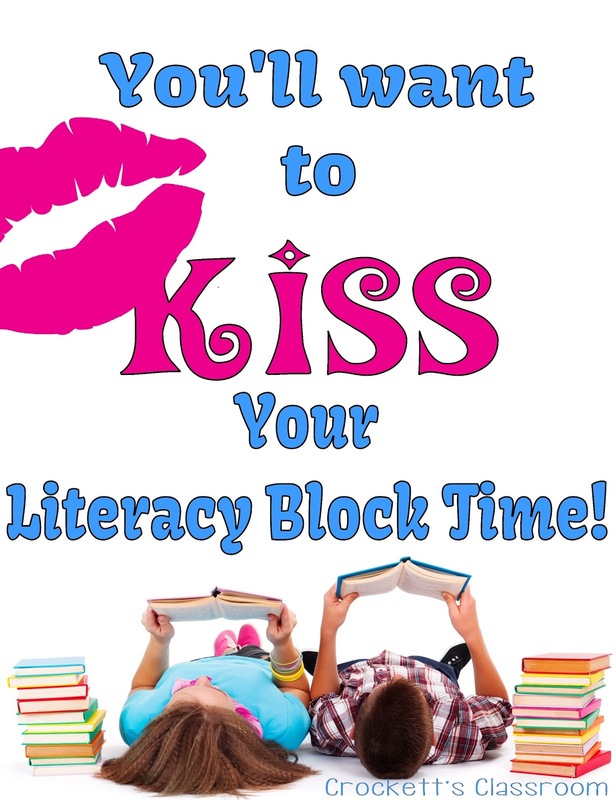 If you're like me you've tried a lot of different schedules for your literacy block time. And no matter what you try, it's still a major scheduling challenge. Every year I'd try a new schedule or rotation system and it never quite worked like I planned. Why does it always look so good on paper and then fall apart once you put it into use???? I'd have one group that needed more time so I'd want to keep them a little longer, but that meant that another group would have to be cut short. I also had a hard time keeping up with the students at the centers because they needed varying amounts of teacher assistance. Finally one year I came up with a way to keep my literacy block very simple. It was one of those "Duh!" moments and it turned out to be the best thing for my third graders and for me! I called this TeRC Time . . . 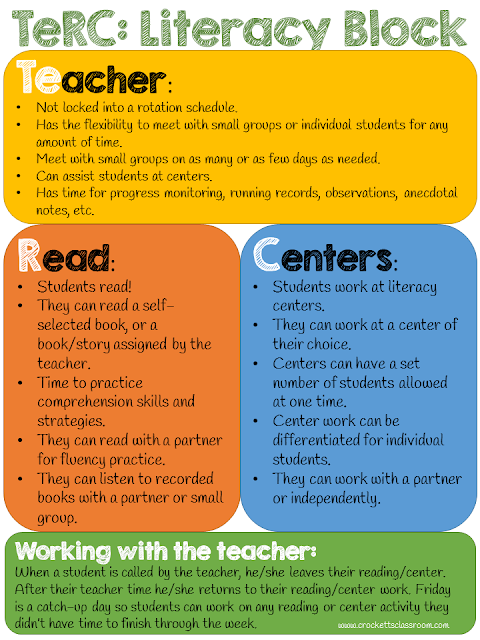 Teacher, Reading, Centers. Basically, the literacy block is divided into two parts: Independent Reading, and Centers. The students are also split into two groups. Make sure the groups are a good mix of ability levels. Also make sure that both groups have good models of behavior and work habits to follow. Group A works on independent reading first and then switches to centers. Group B is the opposite, working on centers first and then independent reading. During the Reading part of the schedule students read. It can be a book they choose for themselves or one selected by the teacher. They can also read with a partner or listen to a recorded story. During the Centers part of the schedule students work on the other activities or written practice. The centers can focus on any literacy skills or strategies for reading or writing. Students can work independently. with a small group or with a partner. During the entire literacy block time the teacher calls small groups to meet with her. 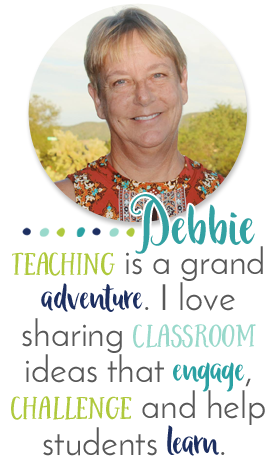 Regardless of where the students are at the time, reading or at centers, they put away their task and join the teacher at the reading table. When their time with the teacher is finished they return to their reading or center activity. 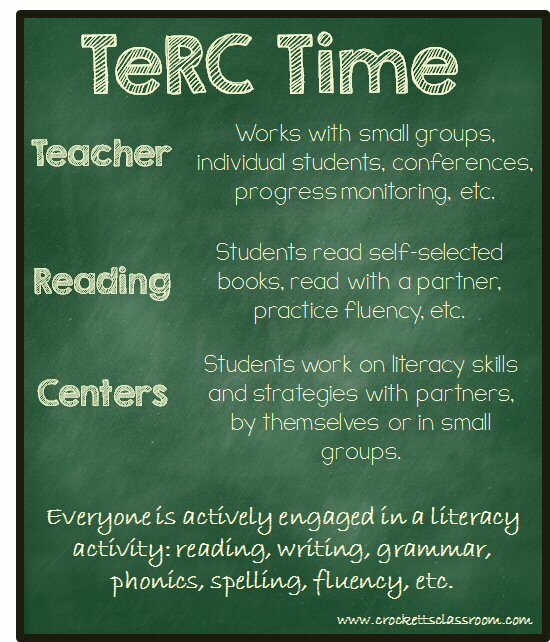 While the teacher works with small groups or conferences with individual students the rest of the class is either reading or working on a literacy center task. This puts more responsibility on the students because they have to pace themselves to complete their tasks by the end of the week. If they are called to work with the teacher during their center time then they may have to complete that center work the next day. Students are also responsible for completing any assignments given in the small groups. This should always be their first priority when they leave the group. Fridays are a “catch-up” day. The teacher, generally, does not call small groups. It’s a good day for the teacher to also catch up on conferences or work with students who need reteaching of skills/strategies presented through the week. The students have the time to finish the reading and center tasks for the week. If they finish everything then they can have more reading time or perhaps play a literacy game.